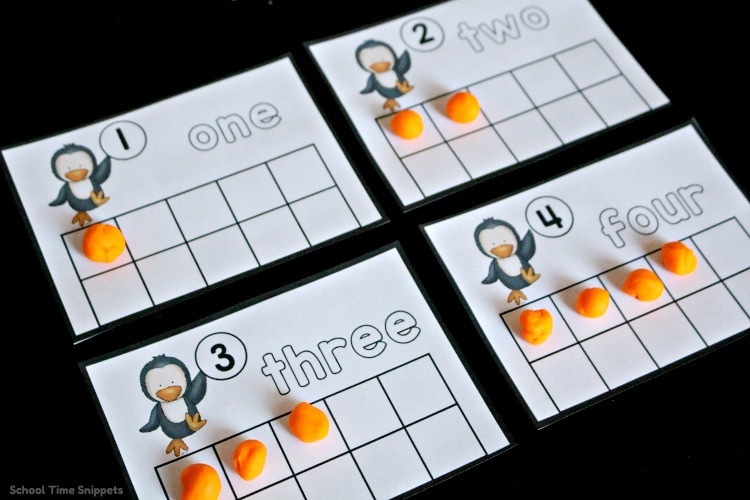 Build number sense with these adorable Penguin 10 Frame Printable Counting Mats. These printable counting mats will help work on number recognition, counting, 1:1 correspondence, fine motor skills, and number word recognition. Use them with your preschooler and/or Kindergartner to work on numbers 1-10. I think penguins are one of the cutest and most fun animals to watch. A few years ago, we were able to see a real penguin at our local shopping mall when SeaWorld did a tour promoting their new Arctic exhibit. You better believe I had Big Brother doing all kinds of fun penguin themed learning activities that week! ... it was much easier to put fun, weekly learning themes together when there were just two! 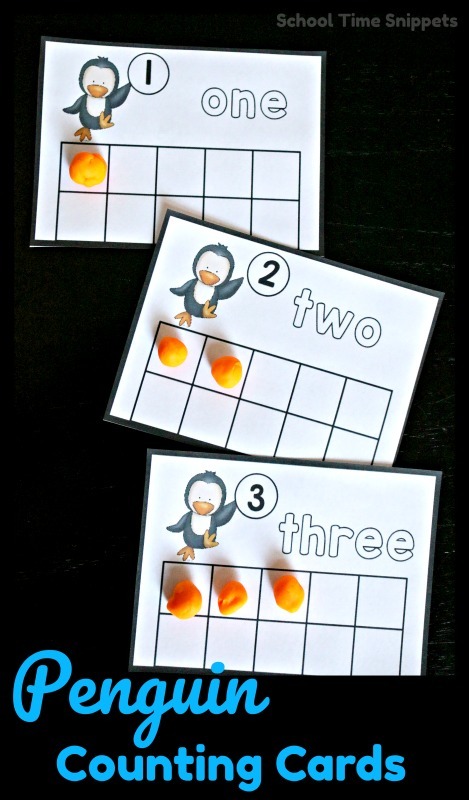 This Penguin 10 Frame Printable teaches early math skills such as: number recognition, counting, 1:1 correspondence, and more! But wait, just what are 10 Frames? Before we share our cute penguin themed 10 Frames printable, let's quickly learn what 10 Frames are... and why they are used! I surely don't recall doing any 10 frame math activities when I was younger. There's certainly nothing fancy about "10 frames." It is simply a block graphic made with 10 squares-- five on top, and five on the bottom. Ten frames can be used with all different types of learning styles, but those that are strong visual learners may appreciate this 10 frame math concept helps your student "see" the number. As the child/ student moves beyond 10, ten frames are akin to "Base 10 Blocks." The number 14 is actually 1 ten and 4 ones! Ten frames also aid in making 10. With 10 frames, you can present simple addition problems such as "3 + ? = 10" and by using manipulatives to fill up the counting mat, the child/student can visualize the missing number. Just a quick little PSA!! I love love love my laminating machine; it was a Christmas present to myself several years ago and it's still going strong. It saved many printables to re-use with my younger kiddos and also kept messy hands and/or tables from ruining the printable. However, it is totally optional... but just in case you weren't sure, I love love love my laminator ; ) It's a great and much-used tool in our homeschool!! Anyways, laminate and cut out each counting mat. Using small manipulatives are a great way to also sneak in fine motor skills! Set the ten frame counting cards and manipulatives out at your math center or school table. Have your child work in numerical order or pick a random number to begin with. Have your child then place that many manipulatives onto the ten frame. For instance, with the number 4, have the child say the number /4/, spell out the word /f-o-u-r/, and then count out four squares on the ten frame. 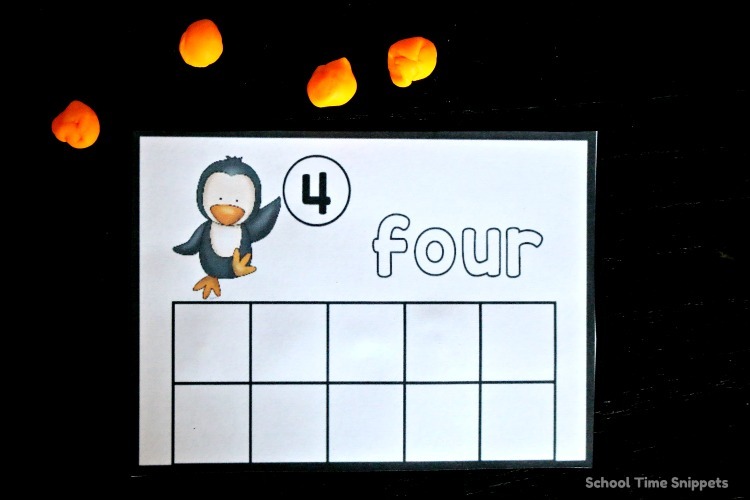 Then have the child make four balls of playdough and lay one ball in each square to represent four. 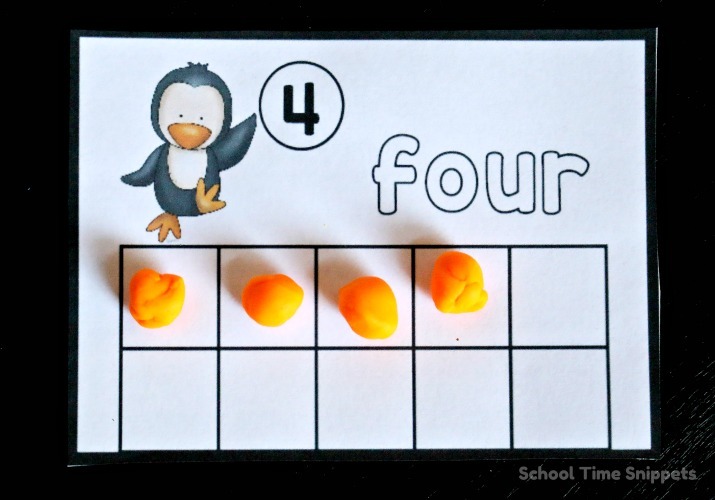 Printable 10 frame counting cards are great for visual and tactile learners. They will be able to see and touch what each number represents. You could also provide the child with a dry eraser marker and have him/her spell the word. And these Penguin Poppers will surely add some fun to your week! 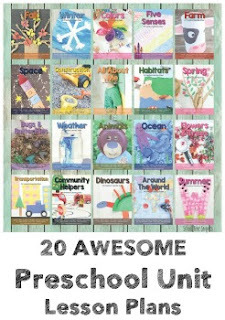 Or save yourself some time and check out 24 Winter Preschool Lesson Plan Activities!! 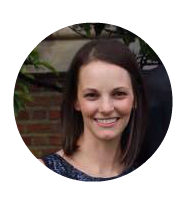 Do no alter, copy, sell, mass distribute, host, or claim printable as your own.